Sorry for the late reply regarding your question. 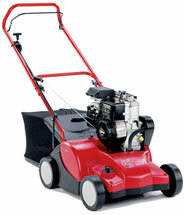 You can scarify as soon as the grass starts to grow strongly. It is also possible to groom the surface which is less vigorous and will just remove lateral growth and thatch without didturbing the roots. Once a lawn has been scarified, is there a requirement to treat the scarified area with a lawn 'tonic', fertilizer or simply water regularly in order to stimulate fresh growth? Can I do this now or wait until the summer is over..? Scarifying will stimulate both root and leaf blade growth so the addition of fertiliser is recommended. However, it is still too early to scarify your lawn vigorously. I would normally time any treatments to start after the end of August and more often than not in the middle of September. The soil will be warm and the days shorter and normally cooler and the chance of rain that will permeate through the soil is increased. As far as fertiliser is concerned - Potash fertiliser is applied going into and through the winter to encourage root growth and recovery. Nitrogen should be avoided unless it is a controlled release. Nitrogen will cause the leaf blade to grow to vigorously and any soft tissue is easily destroyed by frosts diminishing the potential for recovery . I have a lot of moss in my lawn. Is it still acceptable to scarify now or should I leave it until next Spring ? Yes it is OK but try to avoid being too vigorous and do not cut into the roots too deeply. Just brushing the surface with the tines is ideal. This time of year the soil should be radiating enough heat for grass roots to recover and for new grass seed to germinate. Bear in mind that the air temperature could change very soon which will slow the recovery. Be sure that leaves are not aloud to rest on your lawn surface for too long either. I have applied Autumn Feed and Mosskiller and as expected the moss has blackened. Is it still ok to scarify the lawn this late in the year or should I leave it until Spring? I am assuming that it was a combined moss killer and fertiliser. I prefer to add iron in advance of scarifying and then fertilise afterwards to aid grass and root recovery. Scarifying can take place but an important caveat. Do not let the blades cut into the roots. Just imagine the blades (tines) going through as though a comb was being pulled through hair. Aggressive root disturbance now could seriously any real chance or recovery. I'd very much appreciate an impartial view. I've had an offer of having my grass scarified just now (January). I was surprised, given the conventional wisdom of doing nothing during frosty winter months. Thanks for your question. I would be cautious about doing anything to vigorous to your lawn. Grass will be all but dormant in these freezing conditions and recovery from aggressive treatments will be almost impossible. I would only ever attempt a light grooming which will remove thatch and debris without touching the soil and disturbing the root-zone. Hi, i have just cut my lawn yesterday and was going to scarify it on friday, do i add feed /weed granules before scarifying or should i do it after scarifying? Hi I have today vigorously scarified my lawn. Please can you advise me now what we can do to the lawn to make it grow - feed and weed or fertilize and what products would you recommend to get a good healthy lawn. Many thanks. You have to be careful scarifying in stressful conditions and the weather has been rather warm recently meaning the the grass roots will be under a certain amount of stress. I would feed the lawn but you have to make the decision about watering the lawn and keeping it moist so that the fertiliser can move into the soil and do its job. Do not add fertiliser unless irrigation is possible. Waiting for rain is the best option. Hi; I plan to Scarify next week and having never used I am unsure on the affects of my very poor lawn. I also have a problem of a hidden slab of concrete that I know is just below the surface which is to big to dig out. What affect would happen to the scarifier tines if they hit the slab? Also looking at the crop marks I think there is an old path under the surface. I do not want to damage the hired machine. I would be extremely careful of obstacles beneath the surface - why not do a little test dig in the location of the path and concrete slab and perhaps mark out their extremities? You could bend the tines if you it any hard obstacles and it could be expensive - if the concrete is close to the surface, no amount of maintenance is going to keep the grass in good condition. You don't need to seed the same day but when you do, make sure that there is somewhere for the seed to dribble into; either the slit/tine marks or aeration holes from a fork or dedicated machine. It always pays to dress the seed with soil or compost to protect it from birds and dring winds/sun. when is the best time to scarify the lawn. Scarifying your yard will assist with drainage and the health of your lawn. I run a small Birmingham Landscape Company and can tell you that doing so will save you lots of water and fertilizer! Help me if I am wrong but a friend said that after you scarify the lawn you have to put fine sand down first then grass seeds. My lawn has so much moss and weeds in its very hard to find the grass, but I am going to have a go and try my best to have a lawn to be proud of, Wish me luck. I live in the Algarve Portugal. I need to scarify my lawn. As it is January would it be o.k. The weather here is mild 16/17c. Also I have irrigation so water is not a problem. Can you advise me if now is a good time and do you have any further advice. I live in Scotland, Edinburgh, and I scarify my lawn once per month from April through to Sept. It's prone to lots of moss. I apply 4 in 1 fertiliser/moss/weed killer 3 times per year, in April, June and Sept. I add a little seed after each scarification to help any patches that look a little bare. Am I doing anything wrong? The lawn seems to be recovering slowly from years of neglect. hello, I have a large lawn and with the recent hot weather a lot has died or gone lite brown! now that we have had some rain can I scarify and reseed or just leave till end of September? andy. Really best to leave it until the potential for hot weather has subsided. It's best to kill the moss first as it reduces the bulk of arisings when scarifying.